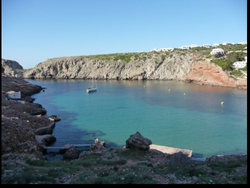 Cala Blanca Bay – Our house dive!  Considered as our house dive site this is the perfect place to dive – not just because it´s three steps away from our Center. 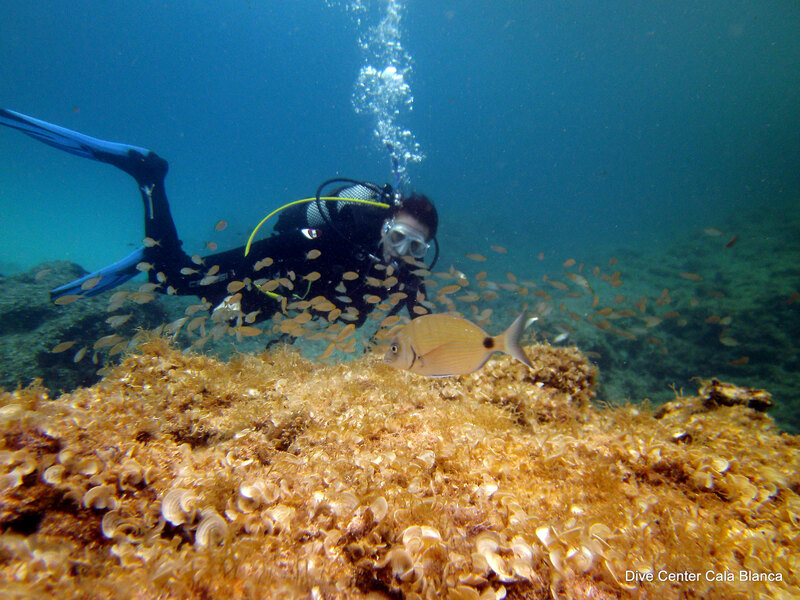 The reef offers shelter to the big variety of sea life from stingrays and octopuses, not forgetting clams and starfish. On top of that you can find great swim thoughs as well as nooks and crannies to be discovered. Because of its sandy bottom this is the perfect spot for courses and the beginner diver but can also be enjoyed by all level of divers. Barracuda Point – The name says everything! This is our second house dive, just outside the bay. As by the name, this spot is just around the corner of the bay and one of the barracudas most favorite places to meet up and chat about the latest news in Cala Blanca. Find also our anemone garden there, next to a lot of cracks and hole where scorpion fishes and moray eels might hide! Canyons – The underwater labyrinth! The topography of this dive site is second to none! 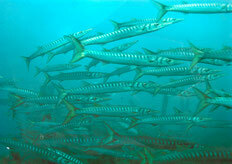 Swim through an underwater labyrinth of channels, which snake through the reef just 20 meters from the shoreline. The canyons are all open and well lit from above. 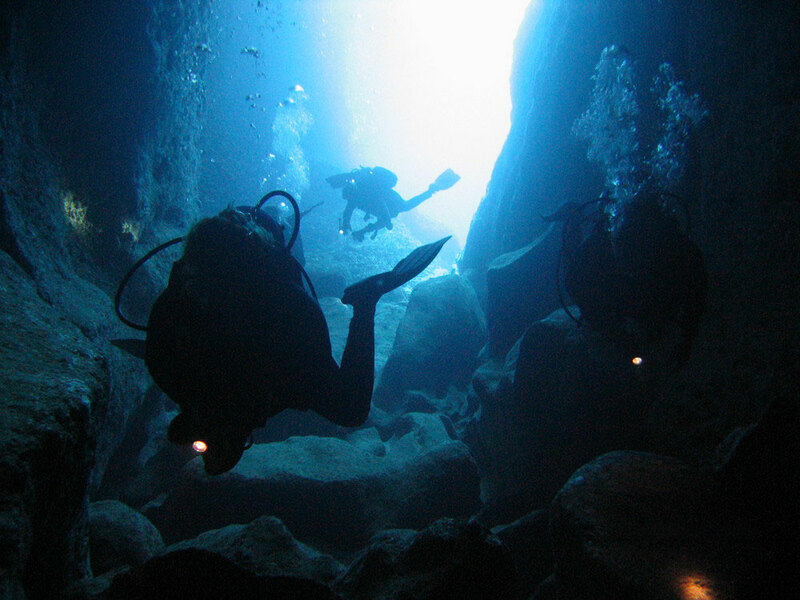 For the more experienced diver the high light of this spot is the Jewel Cavern. Enter through the “letter box”, a small hole, and be amazed by the brightly shining turquoise vast mouth of the cavern. Lighthouse – This is a beam of a dive! This is one of our most popular dives because of its amazing scenery and the wealth of marine life – especially the baby-stingrays like this spot to enjoy the spring there. 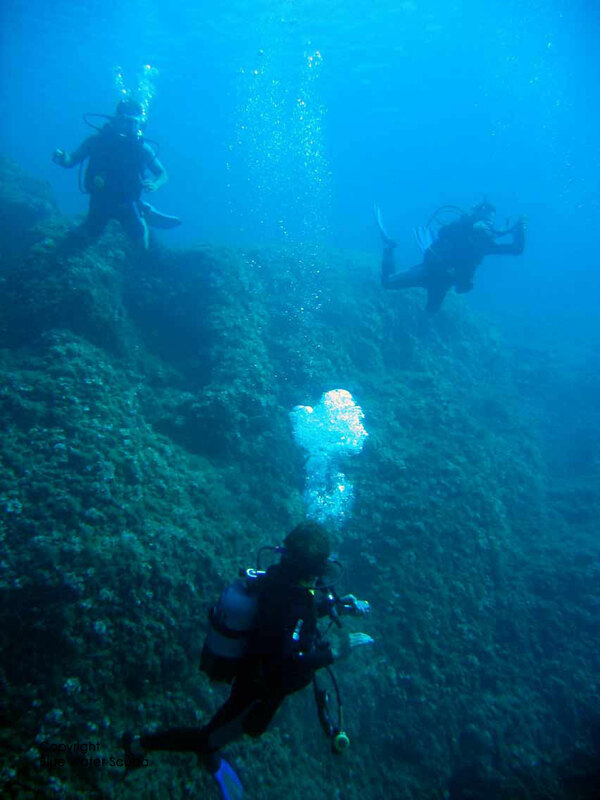 Reefs, craggy walls and huge boulders strewn around on the seabed characterize this site too. The cavern just underneath the lighthouse and some swim throughs make up the finishing touch. Here is so much to see, this dive site is worth visiting at least twice. This dive site is a boat dive - it will be done with a partner dive centre. Slipway – The parachute dive! The easy entry and exit through a slipway is not the only favour of this dive site. 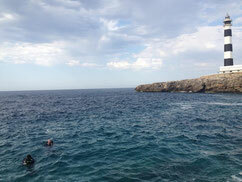 After a nice swim-out you get to the Submarine Rock where you find an exciting drop-down from 6 to 17 meters. Look carefully to see brightly coloured nudibranchs clinging to the side – here is their favourite spot! Massive rocks that fell together form countless crackly swim throughs and out in the sea you might see a crowd of Barracudas having a little rest. Churchdoor – The underwater cathedral! 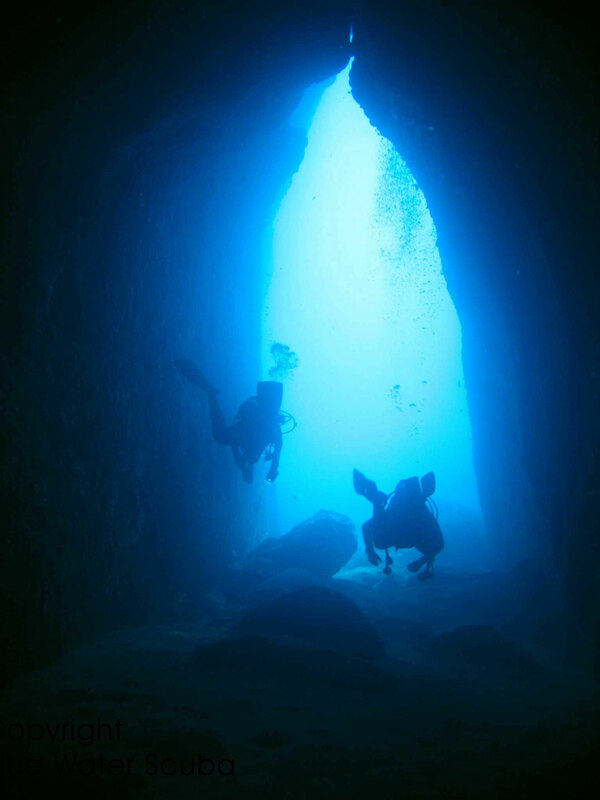 To get to this beautiful cavern we start your dive at Slipway. Explore this spot with its shrimp, prawns, hermit crabs and other miraculous inhabitants. You turn around after roughly 50-60 meters, by then at the latest the reason why this place is called Churchdoor comes clear – the light shines through the high but narrow entry of the cavern in a very bright blue colour and you feel like you´re inside a big underwater cathedral. Tunnel Vision – Let there be light! Enter into a massive crack through a rocky headland. This impressive tunnel splits into two at the centre and joins up again as it leads out of the large cavern opening at 12m. Shrimps and prawn are always awaiting you here in their den. Straight ahead, outside the tunnel, is a wonderful drop-off down to 25m. Either return through the cavern by the second passageway or follow the impressive coastal wall back to the entry point. Son Xoriguer – Pleasant and easy! where stingrays and electric rays are frequently found skulking around. On the return there is a beautiful arch to dive through and plenty of nooks and crannies to be investigated. 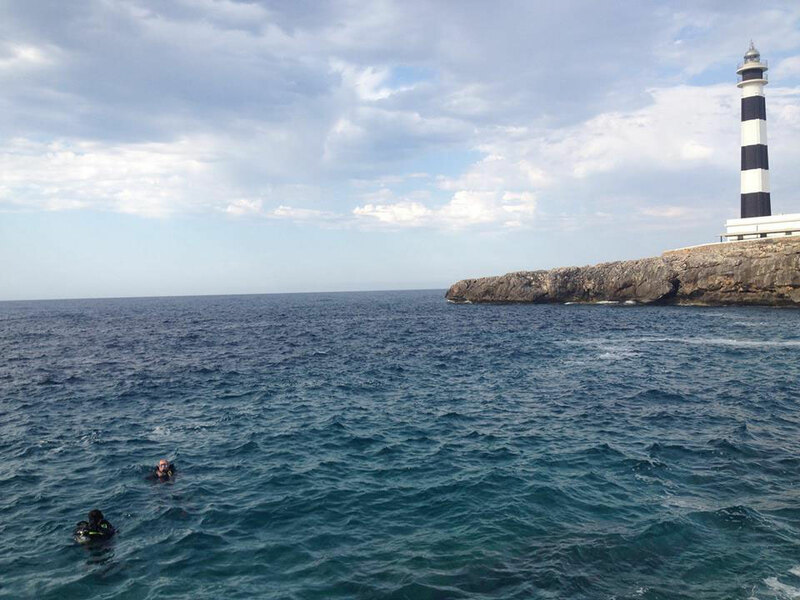 Cala Murta – Not to be underestimated! 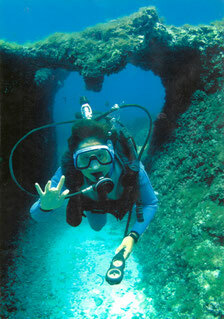 This is a gorgeous dive side with an overwhelming amount of different attractions. 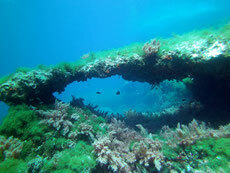 The pith of this spot is a small wreck – parts of a steam powered twin masted sailing yacht are spread over a wide area. Further you will discover an elongated swim-through, overhanging reefs to swim underneath, a beautiful little cavern and a varied range of marine life – starfish, octopuses, anemones, sea spiders and lots of other surprises are waiting for you. This dive site is also known as 'Ponders Cove'. 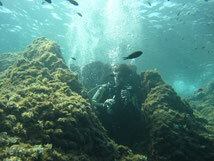 This easy in and out dive site you will find the tinyest swim through's and is a real Mediterranean dive site. Perfect to find octopusses! Lots of hiding spots for all sorts of aquatic life. At the end of the dive we will pass by the 'theater'. A huge overhang in the rocks where you can see fresh water meeting salt water. 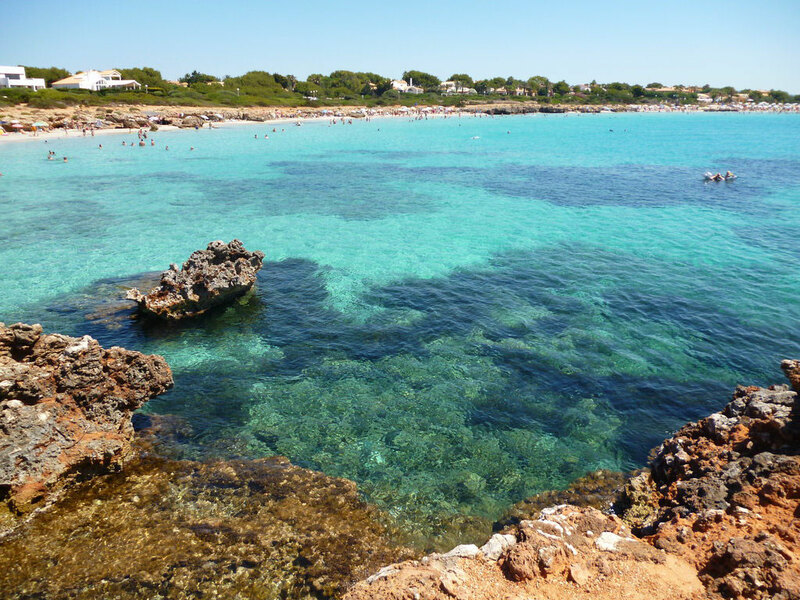 Cala Morell – The treasure box! The small and protected bay is situated north of Ciutadella. You enter this place over a sandy bottom. Many caves and swim throughs apart, you will find lots of old broken amphora, seashells and other interesting things to explore. This is a very relaxing and enjoyable dive. Swiss Cheese – More holes than an Emmentaler! Pont d´en Gil – The king of the caverns! Suitable for almost all divers, this cavern with its 220m of length is a world-class cavern dive. There are few places where daylight cannot be seen or there isn´t a breathable supply or fresh air, so this is a unique chance to experience something very special and surreal. 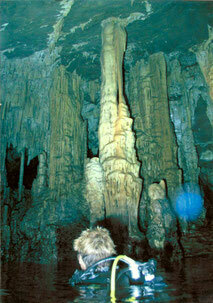 Filled with a stunning display of stalagmites, stalactites and cascades, this cavers is a geological masterpiece. Universally agreed to be a dive in a million! 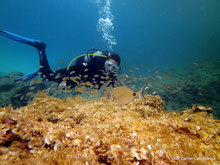 This is a boat dive, done with cooperation of partner dive centers. 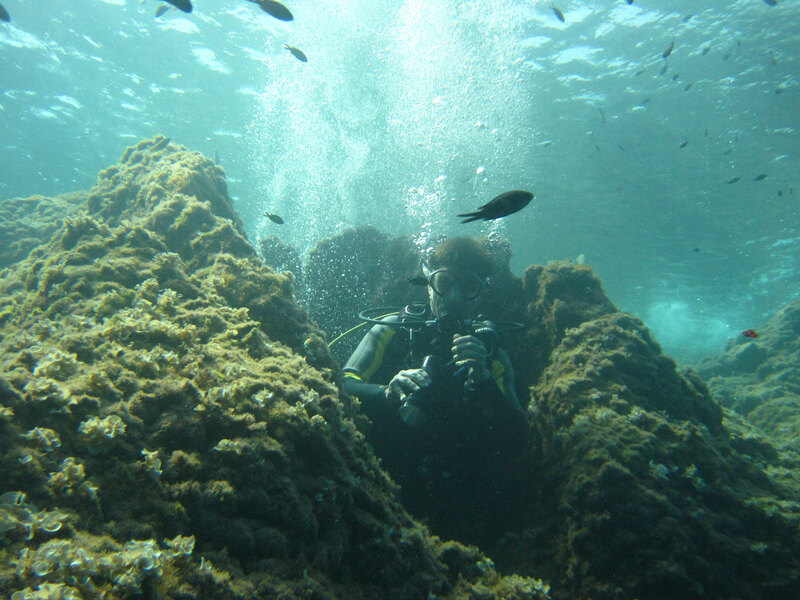 Sitting upright on a sandy bottom this ocean going French-owned cargo steamer, sunk in 1929, forms a fully colonised artificial reefs, some 105m long. This wreck is home to huge morays and scorpion fish as well as attracting many deep-water pelagics, such as barracuda, dentex, gilthead bream, triggerfish and John Dory. 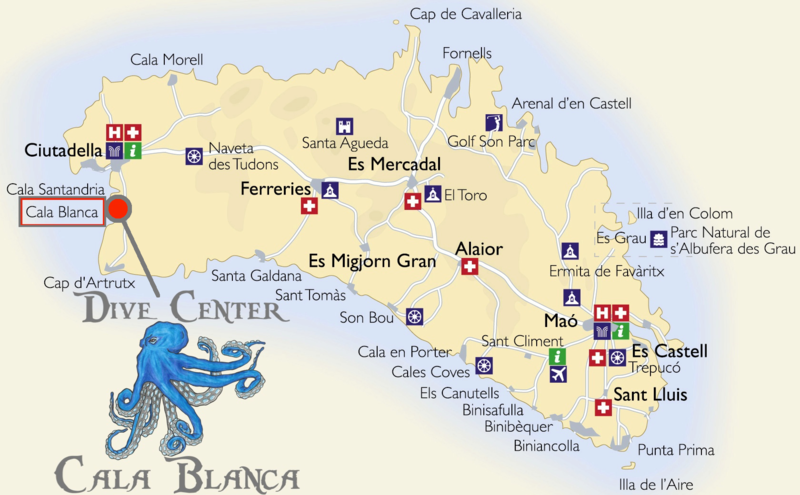 The fish life on her is outstanding, and this is undoubtedly the most prolific dive sit in Menorca. This is a boat dive, done with cooperation of partner dive centers. Prerequestments for divers are min. 100 dives and knowledge in deep and compression diving. 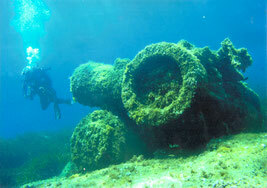 This Spanish coastal steamer, sunk in 1952, is a superb deep wreck dive for experienced divers. Today she stands upright on her keel on a flat, silt-free bottom and is still in near perfecto condition. Her stern rears dramatically up some 8,5m from the seabed. She is well-known for the quantity of marine life and, due to her considerable depth, this wreck attracts some exceptionally large fish, both pelagic (open sea) and benthic (bottom dwelling) species. This is a boat dive, done with cooperation of partner dive centers. Pre requestments for divers are min. 100 dives and knowledge in deep and compression diving.